When a potential book buyer clicks on your book link, where do they end up? If they live in Scotland, do you send them to Amazon US? If they live in South Africa, do you send them to Amazon UK? If you do, you have probably lost a great chance to sell a book because book buyers in the UK cannot buy books from Amazon US, and nor can South African buyers use Amazon UK. Do you open publish? Yes? Great. But how do book buyers who use Apple iBooks or Kobo buy your book? Certainly not from your Amazon Kindle link. Using one online bookstore link to promote your book, such as to Amazon Kindle US, will only work for US buyers, but what about the rest of the world? I know from experience, and my own book sales, that there are keen readers and book buyers all over the world. So how can you help readers find your books at their preferred online bookstore, or at least in a geographic area where they can make a purchase? The solution is to use universal book links to promote your books on all your online bookstores. If you are exclusive with Amazon under KDP Select, a service called Book Linker is a perfect solution for you to make sure your potential buyers are sent to the correct Amazon store. All you need to do is paste in your Amazon book link and this service will create a short link for you. You can even edit the link to include your book title. It works by using the geolocation of anyone who clicks on your link and will send them to an Amazon store that services the buyer. Using this universal Amazon link will be extremely useful for UK authors, because of the restrictions on Amazon UK. With this link, UK and US customers, in particular, will be directed to the correct store. While it is certainly effective for many countries, it is not perfect. I live in the French speaking west of Switzerland and when I click the short link I am sent to the German Amazon store, even though I can purchase from Amazon US, as there is no Amazon store in Switzerland. Plus, I don’t speak German! But apart from rare issues such as mine, Book Linker is certainly a service that will greatly assist authors who are listed on Amazon. Books2Read, which is part of Draft2Digital, offers a fantastic universal link. I can say fantastic because I use their links all the time. With this link, you can add all of your retailers. Yes, ALL! If you publish with Draft2Digital the link will be automatically populated with all of Draft2Digital’s retailers. You can do a scan to check for other retailers too. For me, it found my ebooks on Google Play. But you will need to add your Amazon link. The reason Amazon is manual is because you can add your Amazon Associates account if you have one. But it only takes a few seconds, so it is easy. The result is that you create one link that will give your book buyers a range of retailer choices. If they wish, they can preference a favourite store and always be direct there. Can you use both links? Why not! Depending on where you are targeting your book promotion, you could certainly use both universal link services. For example, if you are promoting your ebook on social media using your 5 Amazon Free Days, a universal Amazon link would be the very best solution. However, if you are open published, you would almost certainly use a Books2Read link on your main website to give visitors a full range of buying choices. Using universal links is a simple solution that will take you only minutes to implement and will improve your book promotion by making it so much easier for readers to buy your books. Thanks – I use BookLinker all the time but I hadn’t heard of Books2Read. Will be investigating! What if you aren’t with KDP but your books are only sold on Amazon and Kindle? 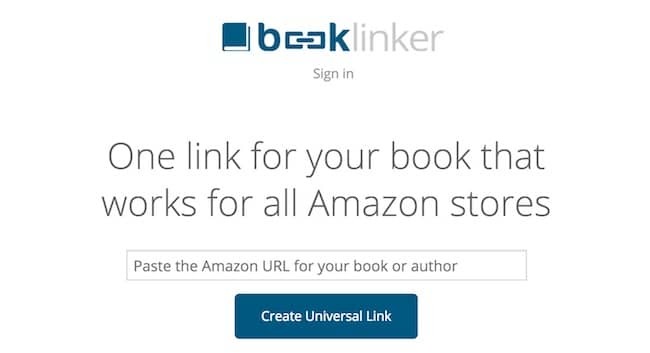 If your books are only on Amazon and Kindle, you don’t need universal links. They are only used for linking to multiple book retailers. My children’s books, ‘Flying Santa’ and ‘Winifred the Wonder Witch’ are on many sites, such as Xlibris (Author Solutions) Amazon, Barnes & Noble and many more. They do not seem to sell and I receive very little in royalties. Most of the prices are far too high, One site was selling ‘Winifred the Wonder Witch’ for $40.00 ! The books are 32 and 44 pages respectively. I realise that you would deduct 10% but this would be better than not selling any books at all. The books have been edited well and have received excellent reviews. I know that children really enjoy reading the stories. Could you please let me know the price you would place on the books. They are on Kindle, but this does not register as an ebook on your site.